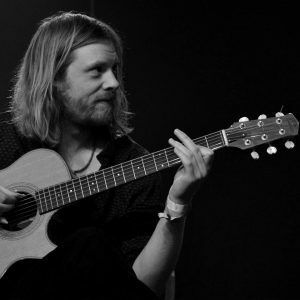 Ben Walker was recently hailed as one of ‘the best acoustic guitarists in the world’ by Total Guitar magazine. A BBC Folk Award winner, a versatile producer as well as a celebrated instrumentalist, he has a passion for putting old jewels in new settings, for bringing together traditional and contemporary music and for playing it like no-one else. With six critically acclaimed albums as a duo with singer/songwriter Josienne Clarke and more than fifty as a producerof other artists, his signature style as a composer and arranger is sought after from punk to Proms. His work has been described as ‘thoughtful’ (Guardian), ‘deft’ (Telegraph) and even ‘legendary’ (Morning Star). An unassuming sort, he self-released his first solo record, an EP – The Fox on the Downs – without fanfare in 2018, showcasing his mastery of his instrument and his love for traditional English music. Reviewers pronounced it ‘jaw-dropping’ (Folk Radio UK), and ‘almost obscenely good’ (Fatea), calling for a solo album soon to follow. Echo is that album. Be the first to hear it played in full by Ben, a full band, and some very special guests at this one-off preview show.